Well its the 10th! That means its day 1 of the preview samples for Papertrey Ink! Today’s post I am sharing a NEW! stamp set by Candice called Forest Friends. It is SOOO cute, and is releasing on the 15th. Let me tell you its really just so ADORABLE! I had a hard time trying to decide just what to share from it for my countdown post with you! I had too much fun with it. I will say it was very hard to make the switch from Christmas to Valentines Day for me this month, as I am working feverishly to complete gift sets for everyone. Crazy times. I figured I would share yet ANOTHER treat holder made using the Nestabilities and this fun set. I was inspired by these little “nut” wrapped Lindt chocolates that Noah got with his birthday gifts (I quickly claimed them as my own! LOL! But promised to give them back after my creative venture was over. Thankfully Noah gets it, and didn’t mind letting me borrow some). They are just so cute and perfect to present to anyone. 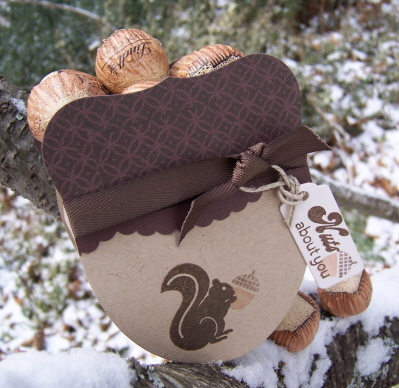 So seeing these, and this little squirrel I had to try a way to make my own acorn holder. Then this idea was born. I love it. Its great for the guy’s too. This project took like 20 minutes to make. It could go faster, but I had no idea WHAT or HOW I was going to do what was in my head. 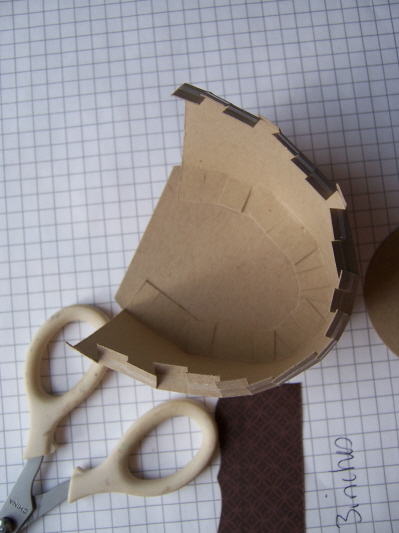 Now when you begin just align the Labels die with the oval die to ensure a compatible topper. You don’t one one that is too big or small. I believe I used the 2nd from the largest of the large set for both die sets on this project. We are decorating BOTH sides of this box. A completed look on both sides makes it not only more professional looking, but appealing as well. 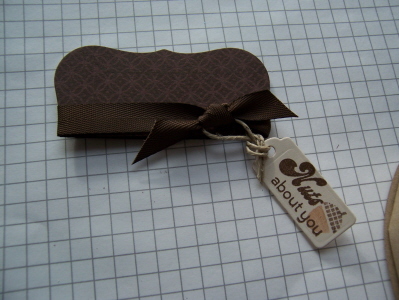 Using Kraft cardstock die cut 2 large ovals. These become the acorn bottom. 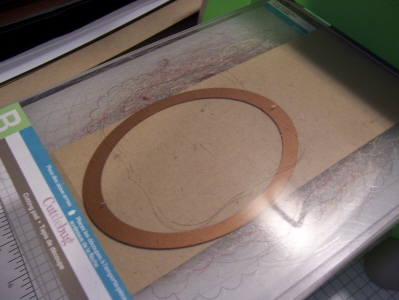 You will cut down the top, so that your oval measures 3 inches. See photo below. Now for our acorn toppers! I stamped my circular pattern from Limitless Labels in dark chocolate ink, on dark chocolate cardstock to mimic the texture of an acorn top. 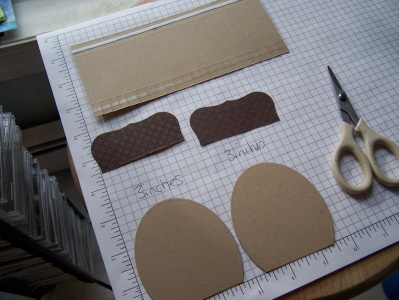 I then used the labels one nestability to cut 2 acorn toppers. This is what you are going to have for pieces. See acorn toppers cut down. Then you want to cut a box bottom/connector piece size 3 X 7. Score that piece at 1/2, then 2 1/2. Apply score tape and remove backing, before you cut! 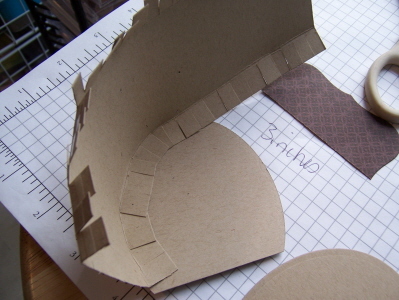 Otherwise you are removing tiny snippets of paper backing from the project, wasting precious time. Can you tell I HAVE done that before? Snip edges to score line all the way across on both sides. 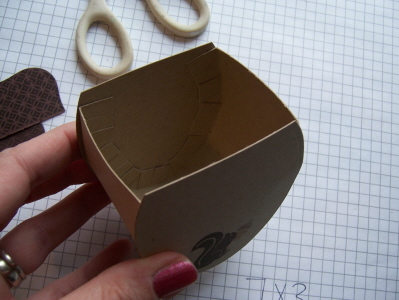 This will allow you to easily bend, and apply the box piece to the curved oval acorn. You slowly adhere it, and curve it as you go, to your acorn back. The box edge go to edge of front and back panel. Soon it will be adhered all the way around. Now before you put your front panel on you need to stamp it!! 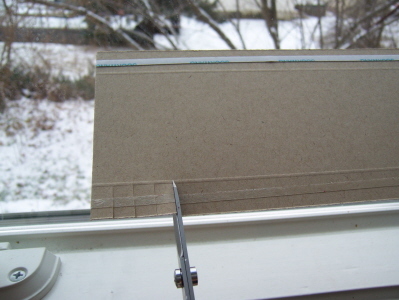 I LOVE acrylic stamps for this purpose alone! Easy peasy. 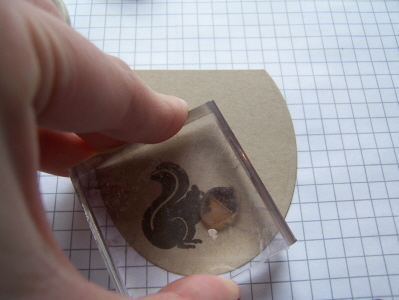 I stamped my squirrel image with dark chocolate ink. 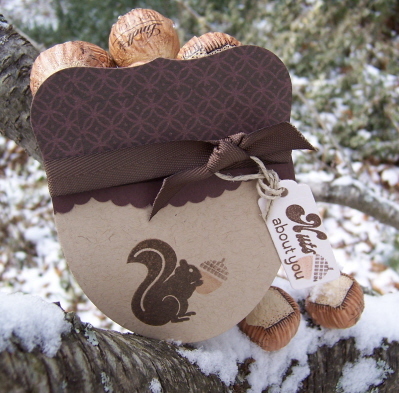 I then colored my acorn image (also from limitless labels) with markers, and stamped it into the squirrels hands. Now adhere the front panel. This is the box with the front panel on. Last but not least we add the topper! 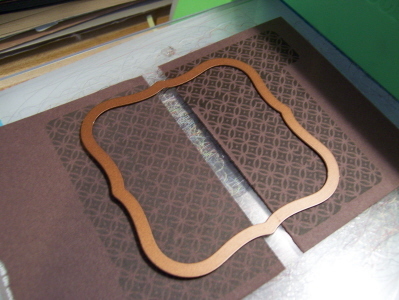 I just used a scalloped border punch from Martha Stewart, to first to make a nice finished edge. Layered it on, then trimmed the excess. You can omit the scallop border portion and its still super cute. This was a last minute detail I wanted. For my final acorn topper, I tied on some dark chocolate twill, with my tag ready to go! 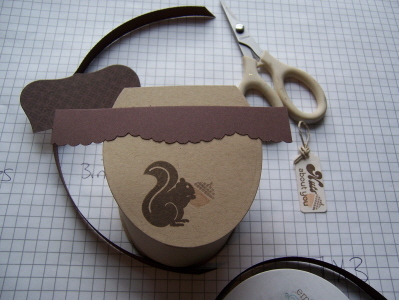 I just die cut my tag, and added the same acorn as in the squirrels hands. Then attached it through my ribbon. Put it on the acorn box, and VOILA!! Thats all there is to it 😀 And yes I did crawl out my window again! There was an actual squirrel by this tree collecting the nuts the kids piled up for him at the bottom. I spent an HOUR trying to get him in my photo!! Wouldn’t that have totally rocked!! It was a no go though :C Apparently Im not furry and friendly enough to be trusted my a squirrel, as I invade his personal space to get get my photo op. I did have some crazy stray orange cat though, that would NOT go away! He kept climbing up the tree next to my box, and making it fall over. How annoying that was. The stories I could tell from my stamp room, I swear. I think my neighbors in the back must think I’m totally mad! Well thats it, for here anyway. Be sure you check out Nichole and Lisa’s blog as well for more peeks! Today Alexa has a post chemo check up, so wish us well! AND Amber has a Christmas recital at the nursing home this afternoon. Busy day.